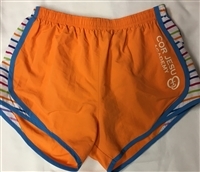 Running shorts by Boxercraft with Cor Jesu Academy screen printed vertically on left side. Shorts are lined with drawstring waist and small pocket in waistband. Originally $24, now marked down to $15. Available in orange, pink or turquoise. Limited sizes available. 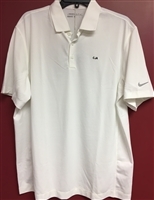 Men's Nike Golf standard fit polo shirt. Stay cool fabric. White with CJA embroidered in black on left chest. Now 50% off - limited supply available. 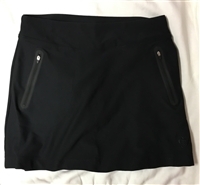 Nike Golf women's skort, made of Dri-fit, stay cool fabric. 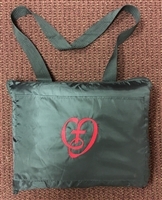 Black, embroidered with CJA heart logo on lower left front, in either black or white, with three zipper pockets. Originally $50, now 50% off at $25. Limited quantities available. Folding stadium blanket perfect for CJ outdoor games! Made of water-resistant black nylon with red fleece on opposite side. Conveniently folds and zips with strap for easy carrying. Embroidered with CJA heart logo in red. Measures 11" x 14" folded, and 45" x 55" unfolded, with 17" drop shoulder strap. Originally priced at $40, now on sale for $30.